What would we do?! (Meme). We would start reading the Norse Mythology books!!! XD. Wallpaper and background images in the The Heroes of Olympus club tagged: the heroes of olympus percy jackson last book life don't know sad funny fanart meme. This The Heroes of Olympus fan art might contain bureau, schrijftafel, and bureau. 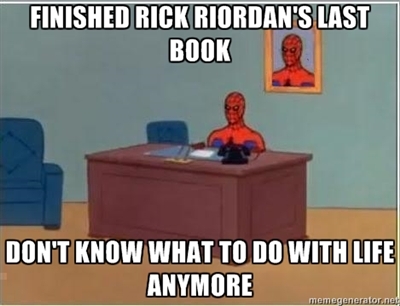 I feel the same way, Spidey. No worries. Don't make me feel depressed! I can't believe you dared to mention the apocalypse! Omg What's gonna happen when HOO is finished?!?! I won't be able to live again! ^^^ @BeyondtheTrees We'll have to make do with the Norse series... yeah no... i think we should take rick hostage and then force him to just keep writing books. who needs real life?